The 2010 World Cup South Africa is just one year away, and Cape Town is getting ready for the crowds. The city is working to implement a new integrated rapid transit (IRT) system, complete with a cashless payment system. Travelers will have to purchase travel smartcards and load them up with funds in order to use city transportation. Gone will be the days of fumbling for exact change when climbing on a bus. The city is enthusiastic about the IRT. "This system will be very sophisticated, a world-class public transport system similar to what they have in London and the America," said city media manager Kylie Hatton. The digital age has steadily lessened our dependence on cash. In a growing number of instances, cash isn't even allowed anymore. Going cashless is certainly speedy and convenient, but it also holds dangers arguably much greater than the troubles it leaves behind, from identity theft by cyber criminals to the ever-piercing eye of Big Brother. Cashless Toll Roads: Toll roads across America are starting to go cashless as a way to speed things up. The E-470 toll road that does a half-circle around Denver officially went all-electronic on the 4th of July. All tolls are now recorded either by the commuters' transponder, or by photos taken of motorists' license plates. Those who have transponders pay by their transponder accounts, otherwise car owners will receive a bill in the mail. About 73 percent of people taking the E-470 this year already used the transponder system, while 19 percent paid cash. The number of transponder accounts went up last month as the switchover to the cashless toll approached. The President George Bush Turnpike in northern Texas turned off the cash flow on July 1st, giving motorists two options; pay through a Toll-Tag account, or get a bill in the mail. Gone are all stops to pay tolls. 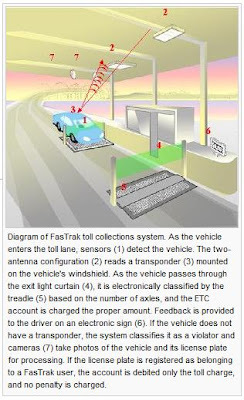 As automobiles zoom along, technology along the turnpike simply matches cars with specific Toll-Tag accounts and deducts the money according to the number of tolls passed. Those drivers without Toll-Tag accounts will have a ZipCash account created for them and will receive a bill in the mail (at a 45 percent higher cost). The South Jersey Transportation Authority is considering going cashless on the Atlantic City Expressway, the Tampa Hillsborough Expressway is intended to go cashless by July 2010, and the Illinois Tollway broke ground on Illinois' first all-electronic toll interchange in April. These toll roads are all way behind Sydney, Australia, where the Sydney Harbour Bridge toll went cashless in January. Cashless toll roads do not seem to present a huge privacy problem. Most people just use these roads as part of their morning routine. However, in the old days when people paid cash, there was no way to keep track of precisely when commuters passed through a station. These days, law enforcement personnel are not the only ones who can find out when you crossed a certain toll point. Divorce lawyers in California have been able to use subpoenas to access California's FasTrak system and determine that John Doe was not at work at 12:30 pm like he'd told his wife. Instead, he was crossing the Bay Bridge into Contra Costa County, where his alleged girlfriend lives. Cash may not be convenient, but it doesn't leave digital tire trails, and there are people out there far more ruthless than John Doe's wife. Many people believe, "Well, if you're not doing anything wrong, what does it matter?" It matters if the people who want to track any of us are up to no good. The power to dig into our digital information does not necessarily fall only into the hands of ethical, honest people. It also matters because the very idea of having Big Brother able to track our every move by definition infringes on our freedoms. We might be very grieved one day to find we've abandoned the freedom of cash in the name of temporary convenience.